Most of the dishes I feature are personal favorites, some are new, and many come from family and friends. I pull recipes from all kinds of sources, including you! Just comment at the end of any post if you have any suggestions for additions or improvements to my recipes, or drop off a note to me at the Aroostook Republican office in Caribou, and I’ll get back to you. Kids and Dads love to prepare breakfast on Mother’s Day. These recipes are so easy but so delicious. The first two recipes are similar but one is savory and the other sweet; both start out with a Yorkshire Pudding or “popover” kind of base. Warning: Do not use skillets that cannot go into the oven, like teflon-coated or pans with plastic handles! Cast-iron or Guardian aluminum are best. 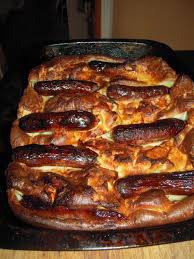 Kids will get a giggle out of the name of this dish, which originates in England and is thought to get its name from how it resembled a toad poking its head up out of a hole. Serve it with a nice fruit cup or sliced strawberries on the side to provide a bit of texture variation and some acid to counter the richness. Preheat the oven to 400°. Mix the batter first so it has time to sit: Put the flour and salt in a medium mixing bowl and pour in the milk and water. Whisk together, then beat in the eggs. Whisk until completely smooth and set aside. Place a cast-iron skillet over medium high heat and put in the sausages. Cook, turning often, until they are browned on all sides. Put in the butter and let it melt; make sure the pan is well coated with fat (you might be able to skip the butter if your sausages are fatty enough). Arrange the sausages evenly in the pan, then give the batter another stir and pour it over. Pop the pan in the oven and bake 20 minutes, then turn down the heat to 350° and bake another 10 minutes. Serves four if everyone behaves, but you might want to double it. 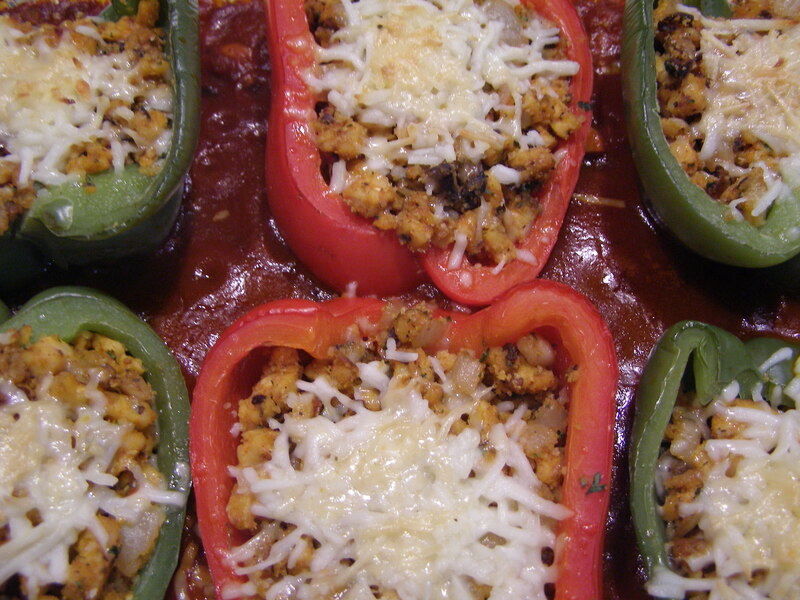 This is a fun dish that will delight any mom! Preheat the oven to 425°. Melt the butter in a large cast iron skillet and saute the apples over medium heat until they begin to soften. Add the sugar and cinnamon and cook just a little more, until soft but not mushy. Scrape them into a pie pan, arranging them to cover the bottom, and let cool. 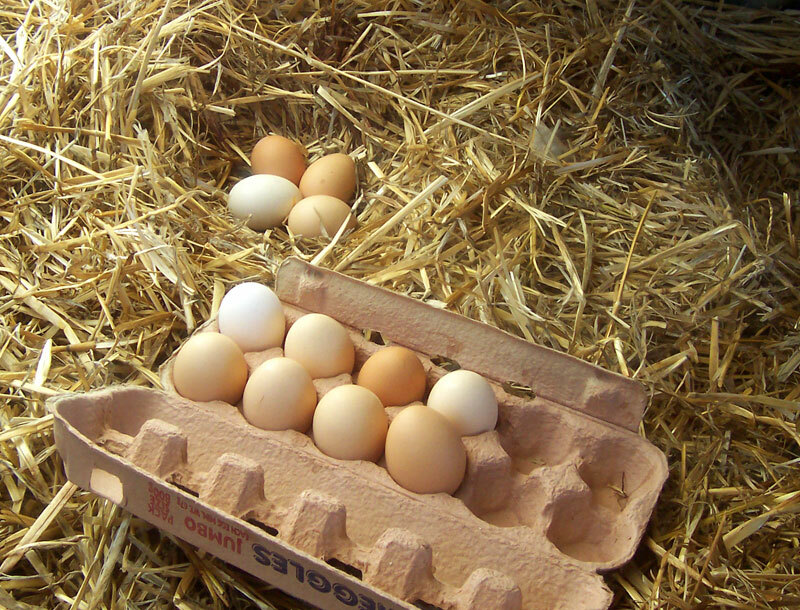 Place the eggs, milk, oil, brown sugar, and vanilla in a bowl and beat well, then stir in the flour and salt. Whisk vigorously, and make sure it’s smooth, or you can use a blender or a hand mixer. Pour the batter over the cooled apples and put the pan in the oven. Let bake 20 minutes, then turn down to 350° and bake another 20 minutes or until golden on top. DO NOT open the oven door while the popover is baking! Cut in thick wedges, and serve hot or cold. This was my mother’s recipe. It is easy for kids to make the night before, and it will create a tantalizing aroma in the morning! Grease a 9 x 13 pan. In a large bowl place flour, white sugar, milk, butter, ½ cup of the brown sugar, baking powder and soda, cinnamon, and vanilla. Beat at medium speed till combined, then add eggs. When well-mixed, pour into prepared pan. In a small bowl, combine remaining brown sugar with nuts and nutmeg. Sprinkle evenly over batter. Cover with plastic wrap and refrigerate overnight or up to 24 hours. Next morning, preheat oven to 350°. Uncover pan and bake 35-40 minutes or until a toothpick inserted in the middle comes out clean. Top should be golden brown. Not just for Mother’s Day. This is great for Christmas morning or to serve to overnight guests. They’ll think you’re amazing. And you are! This dish will intrigue and surprise Mom, but be sure to make enough for everyone! 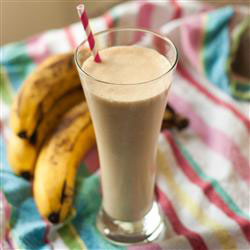 Place bananas, milk, peanut butter, honey, and ice cubes in a blender; blend until smooth, about 30 sec. Makes 4 servings. This one is addicting.